Best of 2017: Beauty | emma etc. I had it in my head I wouldn't be doing a best of beauty post this year - I'm aware that I tend to talk about the same products over and over again. However, I thought I would round up just five products that really wowed me this year - whether they were new in 2017 or simply new to me. Whether high in price or a bargain, I really recommend these above everything else. It's no surprise this foundation ended up in my yearly favourites. Many people have gushed about this base for being effective yet really affordable. Even if you don't end up liking this as much as me - it's hardly going to break the bank if you give it a go. One of the best things about this base is that it's available in so many shades, from the lightest you can think of to the darkest. This is what many drugstore brands lack, so I think it's so great that you can find a perfect match for your skin. The coverage foundation is meant to be a higher coverage than the serum foundation, but I wouldn't say it's super high coverage. This is really nice though, because you still get really decent, even coverage without it looking or feeling heavy on the skin. It also has SPF 15 which makes it a great day-to-day foundation, and the best thing is it has absolutely no scent unlike those overpowering drugstore offerings. The only downside is this foundation sells out like hot cakes, but if you keep checking the ASOS website you might be lucky (at the time of writing they have a good selection of shades in stock). Everyone has been going crazy over this drying lotion, and I for one think it's worth the hype. I have had a lot of trouble with my skin since I was about 16, so I've generally given up on finding a cure for my acne (aside from medication that is), but this product really helps. When my skin is in a bad stage, I generally apply this every day or night, depending on whether I'm leaving the house. It helps shrink spots down and make them a lot more manageable. The key to this is to use it every day or every other day and get in a routine with it. Yes, you look ridiculous with pink lotion dotted all over your face, but because you keep it on for so long it is really effective. I've recently raved about this mascara, but in the last month it has definitely become my go-to product. I like that this is buildable and lifts lashes but won't make them look overly clumpy. This is a great mascara for those who like to have defined, separated, fluttery eyelashes. There are a lot of high end mascaras out there that do just as good of a job as drugstore price ones, in fact I would argue this mascara is better than those luxe expensive offerings. My foray into high end eyeshadows has been brief so far, but I fell in love with this By Terry eyeshadow and there's no going back. They are named 'melting eyeshadows' for a reason - they blend extremely nicely, providing a pigmented, almost metallic wash of colour to the lids that is also wearable. I think there is only one other shade I would like to buy eventually, but Bronze Moon is such an all round beautiful shade for all skin and eye colours. I'm not going to lie, one of the main reasons why I love this highlighter is the amazing heart shaped packaging. However, I really rate this product after using it for a good few months. This shade is more of a cool toned pearl colour which I think would suit a lot of skin tones, but they also have a pink-based shade and a gold toned one. I would say this is a powder highlight, but it is a really creamy one and works best with a dense brush for ultimate pigment. 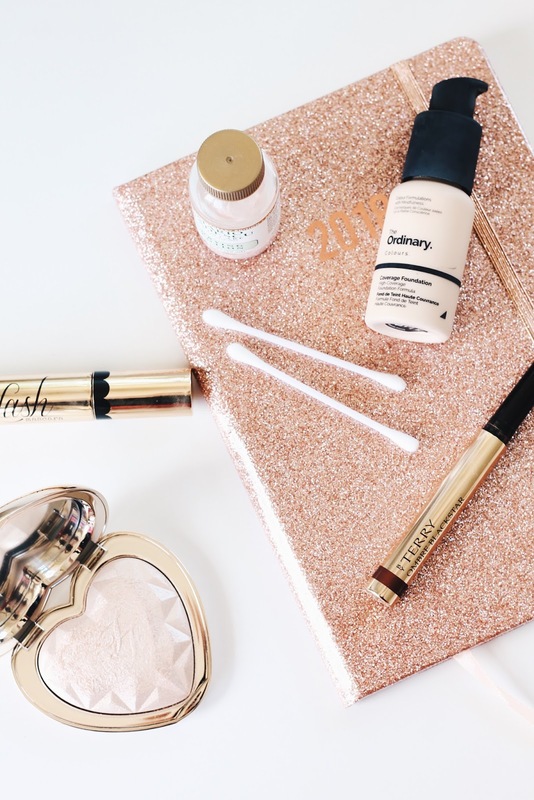 I hope you enjoyed this post even though it has a small amount of products, but I think it's probably a better way of doing it so I only include my absolute favourites and essentials. and yep - i would love that heart shaped packaging too. am always a sucker for a bit of cute when it comes to make up! I've also been tempted to buy one of those Too Faced highlighters just because the packaging is so flipping cute, but I've managed to resist so far... Will definitely be picking up The Ordinary foundation at some point! The mario badescu drying lotion is such a life saver - also really want to try the ordinary coverage foundation, heard so many amazing things! I've wanted to try the Mario Badescu drying lotion for a while, but the smell puts me off so much, plus since it looks like 90% alcohol I'm not sure if I want to give it a go? Anyway, I think my top product of 2017 was the Maybelline Lash Sensational. There are very few products I repurchase unless I absolutely LOVE it, and this is one of them!